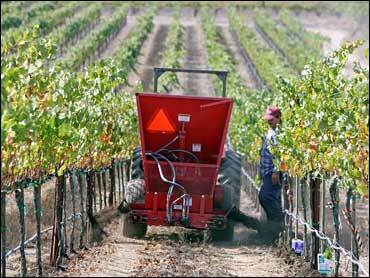 Climate warming could spell disaster for much of the multibillion-dollar U.S. wine industry. Grapes used in premium wines need a consistent climate. When temperatures top about 95 degrees, grapes have problems maintaining photosynthesis and the sugars in the grapes can break down, Diffenbaugh said in a telephone interview. "We have very long-term studies of how this biological system (of vineyards) responds to climate," said Diffenbaugh, and that gives the researchers confidence in their projection. Diffenbaugh is a co-author of the paper. Scientists and environmental experts have become increasingly alarmed in recent years by accumulating gasses such as carbon dioxide in the atmosphere as a result of the burning of fossil fuels. A panel of climate scientists convened by the National Academy of Sciences reported last month that the Earth is heating up and "human activities are responsible for much of the recent warming." The scientists said average global surface temperatures rose by about 1 degree in the 20th century. While that may not sound like much, many blame it for melting glaciers, weather changes — perhaps even more hurricanes — and threats of spreading diseases. Andy Beckstoffer, a California vineyard owner, has no doubt that global warming is coming, but believes science is producing hardier grape stock and new ways to irrigate to resist hotter weather. James A. Kennedy, a professor of food science and technology at Oregon State University, said he was shocked by the report on the potential effects on wine grapes. "We're definitely, in the wine industry, starting to be concerned about global warming," said Kennedy, who was not part of the research team. "The lion's share of the industry is in California, so it's a huge concern from a wine quality standpoint," he said. For people in the industry "this paper is going to be a bit of a shocker." While problems are seen for California wine country, the paper suggests grape-growing conditions might improve in parts of the Northwest and Northeast. However, the researchers note that the Northeastern and Northwestern states have higher humidity levels than the current top wine regions. High humidity is associated with fungus outbreaks and other potential growing problems, Diffenbaugh said, "so it could be very expensive to produce premium wines in those areas." "Our simulations suggest that the area suitable for the production of premium wine grapes will both contract and shift over the next century," the researchers concluded. "Production potential was almost completely eliminated in the Southwest and central United States; only high elevations were marginally suitable in the Intermountain West," they reported. Some favorable regions remain in coastal California, Oregon, Washington and New England. A thousand years ago when Viking explorers arrived on the coasts of eastern Canada and New England, they named the region Vinland, a designation that has perplexed many historians since grapes are uncommon there now. The weather was warmer then, however. In Medieval times, there were vineyards in England that were later knocked out by a colder period known as the Little Ice Age, Diffenbaugh recalled. Now, wine grapes are being grown in England again. The research was supported by the National Science Foundation, National Center for Atmospheric Research and the National Aeronautics and Space Administration.